View More In Night Lights. 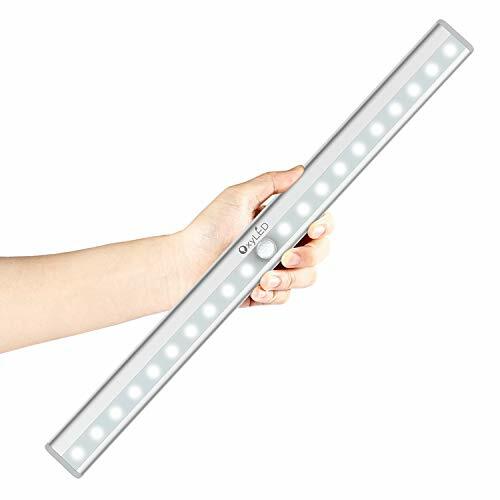 LIGHT THAT NEVER GO OUT OF STYLE - OxyLED T-02s 20 LEDs Rechargeable Motion Sensor Night Light Bar OxyLED - Lights you can live by OxySense - Glows when you need it The OxyLED T-02S is the upgraded version of T-02 motion sensor light, Using both infrared (PIR) technology to detect body heat and the human motion sensor (within 3m), the OxyLED T-02S Wireless Motion Sensor Light turns on or off based on occupancy and ambient light levels. It is designed to substitute a standard light switch and built for convenience and personal safety in dark areas. It has a built-in rechargeable battery via micro USB. It is ideal for corridors, cabinets, workshops, basements, indoor garages, stairwells, doorways, closets, and other dark places in your home and shed. Specifications: - Sensitivity: 3m/10ft - Sensor Range: 120 degrees - LED Qty: 20 LEDs - Light color: Pure White - LED life: 50,000 hours or more - Battery: built-in 3.7V 600 mAh li-ion battery - Material: Aluminum+ABS - Size: 36cm*3cm/1.2ft*0.1ft - Light weight: 228g / 8oz - Output power: 1.5W - Luminous Flux: 150 lumen Here are some instructions for your reference: 1. T-02s motion sensor night light will auto illuminate when someone gets close to the sensor in enough DARK environment(as it is equipped with a light sensor) If the surrounding environment is too bright, it will not work perfectly. 2. If the light continue detecting motion, it will keep lighting (which seems "never" turn off), it will turn off in 15s after no motion be detected. 3. Pls kindly check the location you install the light, if there is any barrier block the sensing range, the motion sensor function will not work well. 5. Don't put 2 OxyLED T-02s motion activated LED night lights too close. The light of one night light may cause the other not light up if they are too close. If you have any questions about this product by OxyLED, contact us by completing and submitting the form below. If you are looking for a specif part number, please include it with your message.